This was my first experience ever with snowshoes and it was really rewarding. You should try it. I was in Sulwald once before, it is on the way up the mountains from Isenfluh. Sulwald actually is a very little village with maybe 10-20 houses, not more. In a summer time where is just farmers living there, keeping their cattle and of course many tourists walking many paths that place have to offer. 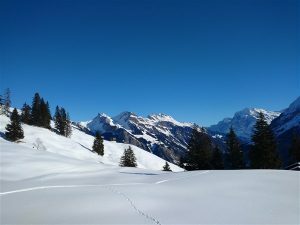 Snowshoes itself are not very expensive, you can get a decent pair from 80 to maybe 150-200 euros, but if you do not live in a mountainous region and do not expect to use them quite often, renting them in Switzerland is a possibility. There is a very nice rental shop down in Interlaken which offers a pair of snowshoes for one day for 20 CHF, which is around 19 euros, 18 USD. The link to that shop is here: renting snowshoes. 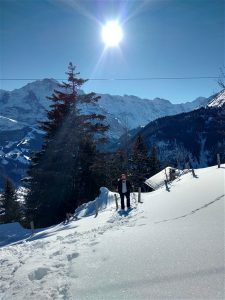 Very nice and friendly place, as well they offer snowshoe tours and many other activities if you would like to go with your friends or you are visiting Switzerland with big group of people. How to get to Sulwald? In a winter time Sulwald is not really reachable by simple car, you at least have to have chains on your wheels or something even more efficient. Maybe snowmobile. To reach Sulwald, first you have to go to Isenfluh which is a very nice city. It offers couple of parking spots, but the biggest one is when you just simply cross all the village. It’s just maybe 500m to cross Isenfluh 🙂 Parking costs 5CHF for 4 hours which is quite enough time to enjoy the mountains. After parking your car, you should walk back to the town and find a cable which takes you up to Sulwald. 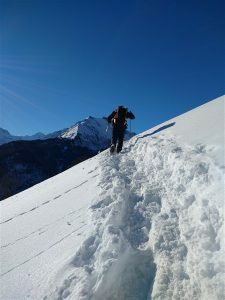 Actually, you could just simply go straight to the mountains from Isenfluh, but in winter time they are not really used too much, not too many tracks, so the snow is really deep and it can get quite difficult to walk. So that nice old red cable car will cost you 12 CHF both ways. It will take maybe just 5 minutes to go to Sulwald. There is as well a nice cosy coffee place in Sulwald, next to cable car station, which offers some basic stuff: pies, coffee, tea, soup. So if you are tired and hungry after your hike, it’s a very nice place to recover. When you leave the cable car you will immediately see a lot of people putting snowshoes on and preparing for a hike. It’s quite popular place to snowshoe, but definitely not overcrowded. So, when you begin to walk, there is quite clear path which you have to use. As I said, if you want, you can go offroad, but it can get quite difficult if you are not experienced.